Dimensions 0.50 by 5.25 by 6.75 in. A metallic cylinder falls to earth, landing in the sands of Horsell Common, Surrey, generating curiosity and awe. But whatâs inside soon induces only terror. The story that unfolds is a breathless first-person account of an inconceivable reality: an extraterrestrial war has been waged on the planet. In a twist on cautionary turn-of-the-century invasion literature, H. G. Wells posits the Martian attack as an insurmountable apocalyptic event. The first of its kind and a foundational work, The War of the Worlds inspired a radio broadcast, television shows, graphic novels, and countless films; roused the imagination and stirred anxieties; and changed the landscape of science fiction for generations. AmazonClassics brings you timeless works from the masters of storytelling. Ideal for anyone who wants to read a great work for the first time or rediscover an old favorite, these new editions open the door to literatureâs most unforgettable characters and beloved worlds. 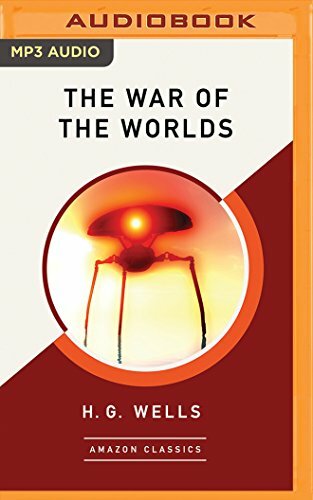 Revised edition: Previously published as The War of the Worlds, this edition of The War of the Worlds (AmazonClassics Edition) includes editorial revisions.